IP Result of anti-Cytokeratin 6A-specific (IP:16853-1-AP, 4ug; Detection:16853-1-AP 1:300) with HeLa cells lysate 520ug. Keratins are a large family of proteins that form the intermediate filament cytoskeleton of epithelial cells, which are classified into two major sequence types. Type I keratins are a group of acidic intermediate filament proteins, including K9–K23, and the hair keratins Ha1–Ha8. Type II keratins are the basic or neutral courterparts to the acidic type I keratins, including K1–K8, and the hair keratins, Hb1–Hb6. Keratin 6 is a type II keratin. It is used as marker for epidermal hyperproliferation and differentiation. 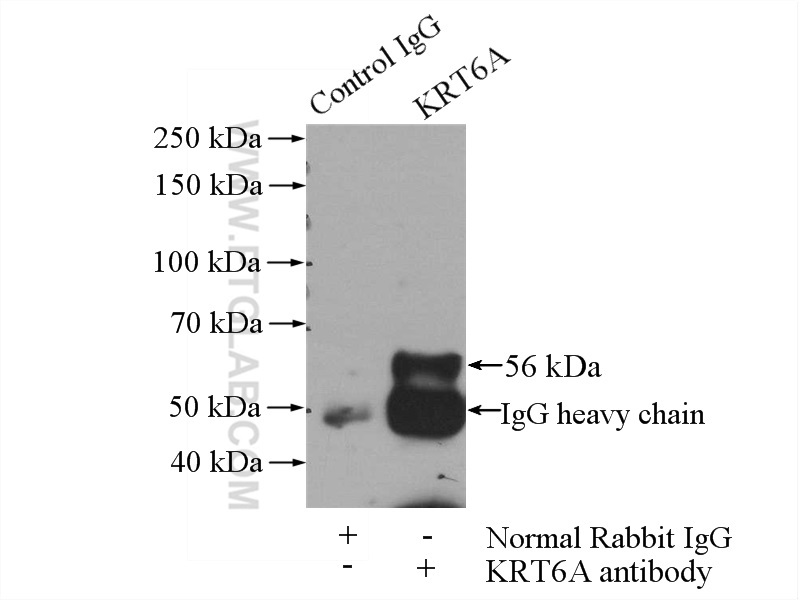 Three keratin 6 isoforms were found, ketatin 6A,6B and 6C. They share more than 99% identical DNA sequence. This antibody is against all three isoforms of keratin 6, but it does not bind other keratins.